A small object spotted by Rainer Kracht of Elmshorn in Germany, in an image from SOHO received via the Internet, has been officially confirmed as Comet 2002 P3 (SOHO). 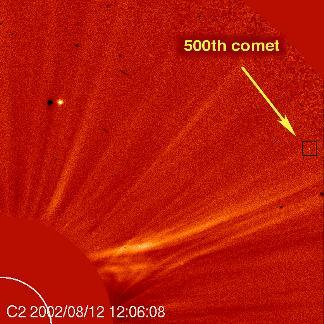 It is the 500th comet discovered with the ESA-NASA solar spacecraft and it made its closest approach to the Sun at 16:05 Universal Time on Monday, 12 August. Diane McElhiney won a contest run by the SOHO science team for guessing that date and time for SOHO-500. Her prediction was too early by only 103 minutes. The video clip (MPEG, GIF, Quicktime) shows the comet (in the small black square) moving over a four-hour period. The larger black square shows a close-up of the comet over time that has been superimposed on the movie. The LASCO coronagraph on SOHO, designed for seeing outbursts from the Sun, uses a mask to block the bright rays from the visible surface. It monitors a large volume of surrounding space, and as a result it became the most prolific discoverer of comets in the history of astronomy. Most of them are small sungrazer comets that burn up completely in the Sun's hot atmosphere. More than 75% of the discoveries have come from amateur comet hunters around the world watching the freely available SOHO images on the web. The biggest tallies have come from Mike Oates in England, Rainer Kracht in Germany and Xavier Leprette in France. They went back over pictures from 1996-99 and found dozens of comets that the professionals had overlooked. Mike Oates is the highest-scoring discoverer of comets ever, with 136 to his name, while Rainer Kracht has discovered 63. The comet has been designated as C/2002 P3 (SOHO) with a perihelion time of Aug 12 at 16:04:48 UT. Perihelion is the comets closest approach to the Sun. A sweepstake run by the SOHO science team for guessing the date and time of the 500th comet attracted 1256 entries. The winner of the "Guess the perihelion time of the SOHO-500 comet" contest is Diane McElhiney who missed by only 1 hour and 43 minutes. The runner up is William Trost. Grand prize: collector edition SOLARMAX DVD and Solarmax T-shirt. Runner up: standard edition SOLARMAX DVD and Solarmax T-shirt. SOLARMAX DVD courtesy of Slingshot Entertainment (www.Slingshotent.com) and Solarmax T-shirts courtesy of the Museum of Science and Industry - Chicago. Solarmax (www.Solarmovie.com), A Heliograph Production (www.Helio.com.au) in association with the Museum of Science and Industry - Chicago (WWW.MSIChicago.org), with support from the National Science Foundation and ESA. Distributed by Musuem of Science and Industry Film Distribution. VHS and DVD distributed by Slingshot Entertainment (www.Slingshotent.com) available at video retailers worldwide. 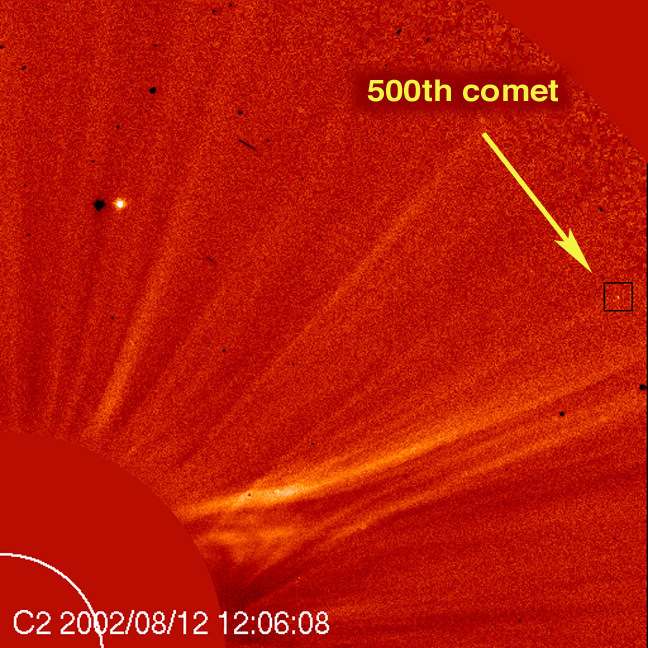 To learn more about SOHO and sungrazing comets, go to http://ares.nrl.navy.mil/sungrazer/.